A cat in poor health. Feline herpes, or FHV-1, is found in both adult cats and kittens. It is a disease that affects the respiratory system and eyes. Animals that have this disease can spread it to other animals, even if they appear healthy. This highly contagious respiratory disease can cause death in kittens and severe illness in adult cats. The transmission of the feline herpes disease can happen in several ways. The disease is carried in eye, nose and mouth discharge. It can be passed from a mother cat to her kittens, because she is in close contact with them. It may also be passed from one cat to another by coughing, sneezing and rubbing against each other. The disease may also be transmitted from seemingly healthy animals. These animals are known as "latent carriers", and they were infected with the disease at some time during their lives. Once an animal is infected with FHV-1, the virus is never completely eradicated from its system. These cats carry the virus in their nerve cells. In addition to the upper respiratory infection associated with feline herpes, the following conditions may also be present. Conjunctivitis - This is an inflammation of the conjunctiva, the lining of the eyelid. 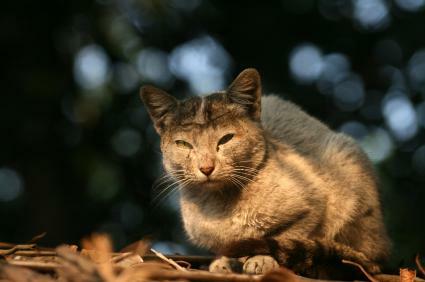 Cats with this condition often have red, runny eyes. This causes pain in the animal and it will frequently rub its eyes with its paws. Ulcerative Keratitis - This is a more severe eye infection that can cause blindness when not treated. This causes ulcerations and inflammation to the cornea of the eye. There is discharge when this condition is present, and the animal will be sensitive to light. Since ulcerative keratitis is painful, the animal will frequently rub its eyes. Anorexia - Animals that have difficulty breathing cannot smell their food and may eventually quit eating. Animals with this condition need assisted feeding, either from a veterinarian or after being instructed in the proper feeding procedure. Once a veterinarian has examined the animal, the condition can be quickly diagnosedwith one of the following methods. Swab samples - A sample of secretions may be taken from the nose or mouth and tested for the virus. Smears - A smear may be taken of the eye discharge to determine if infected cells are present. Physical examination - Seeing the animal in person is one of the best ways to assess its condition. Keep the sick animal indoors until it has recovered. Keep the cat in a warm, well-ventilated room. Provide a lot of fresh food and water, making it available at all times. Clean the eye and mouth area as needed. Use a humidifier to help break up mucus in the airways. Keep the litter box clean. Animals that have developed feline herpes need special care for at least seven to ten days while the virus runs its course. Ideally, kittens should be vaccinated in two doses - the first at eight to ten weeks of age and again at fourteen weeks. An annual vaccination should be given thereafter. Vaccination doesn't prevent the disease, but it lessens the severity and limits deaths associated with this disease.